Freestyle terrain may contain jumps, hits, ramps, banks, fun boxes, jibs, rails, half pipes, quarter pipes, snow cross, bump terrain and other constructed or natural terrain features. PRIOR to using Freestyle Terrain, you are responsible for familiarizing yourself with Freestyle Terrain and obeying all instructions, warnings and signs. Freestyle skills require maintaining control on the ground, and in the air. 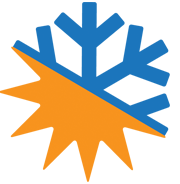 The orange oval is a symbol, which identifies freestyle terrain on the hill. Check out the sample signage and vocabulary to make sure you're up to speed on the basics. 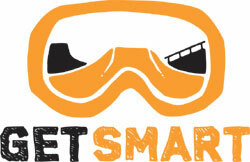 Smart Style is a terrain park safety initiative, which you need to understand in order to use terrain parks safely. MAKE A PLAN - Every time you use Freestyle Terrain, make a plan for each feature you want to use. Your speed, approach and takeoff will directly affect your maneuver and landing. LOOK BEFORE YOUR LEAP - You are responsible for inspecting Freestyle Terrain before initial use and throughout the day. The features vary in size and change constantly due to snow conditions, weather, usage, grooming and time of day. Do not jump blindly. Use a spotter when necessary. EASY STYLE IT - Always ride or ski in control and within your ability level. Do not attempt Freestyle Terrain unless you have sufficient ability and experience to do so safely. You control the degree of difficulty you will encounter in using Freestyle Terrain, both on the ground and in the air. RESPECT GETS RESPECT - Respect Freestyle Terrain and others. Only one person on a feature at a time. Wait your turn and call your start. Always clear the landing area quickly. Respect all signs and do not enter Freestyle Terrain or use features when closed. USE OF FREESTYLE TERRAIN EXPOSES YOU TO THE RISK OF SERIOUS INJURY OR DEATH. INVERTED AERIALS ARE NOT RECOMMENDED. YOU ASSUME THE RISK! Skiing can be enjoyed in many ways. At ski areas, you may see people using alpine snowboard, telemark, cross-country and other specialized ski equipment, such as that used by disable or other skiers. Regardless of how you decide to enjoy the slopes, always show courtesy to others and be aware that there are elements of risk in skiing that common sense and personal awareness can help reduce. Observe the code listed below and share with other skiers the responsibility for a great skiing experience. Prior to using any lift, you must have the knowledge and ability to load, ride and unload safety. Know the code. It's your responsibility. This is a partial list. Be safety conscious. 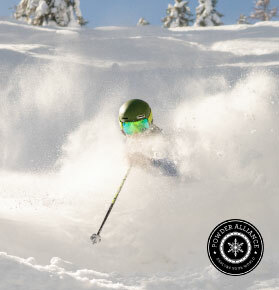 Officially endorsed by the National Ski Areas Association. 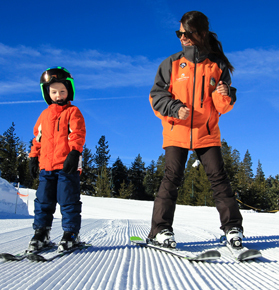 Skiing in its various forms (Alpine, Nordic or Boarding) is an inherently hazardous sport with many dangers that can cause injuries and/or death. You should understand that by using the facilities, you are agreeing to assume all risks of injury, properly damage, and/or death. Your purchase of the ticket and its use are an agreement to hold China Peak Mountain Resort harmless for your injuries, property damage and/or death that may occur in any way during your use of our facilities. If you do not agree to be bound by the above, please do not purchase a ticket or use the facilities. Please read your lift ticket carefully. Skiing and snowboarding off groomed runs in powder is one the best parts of the sport, but can have deadly results if the proper precautions are not taken. 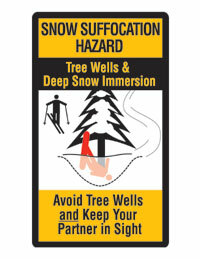 Tree wells and deep snow can trap you and lead to Snow Immersion Suffocation (SIS). Tree wells form around the bases of trees when snow falls on branches and around the tree, creating a deep pit near the trunk that can become a trap for skiers and snowboarders. Also, deep snow can be overwhelming to the point where you cannot pull yourself out. Both can be deadly. The best way to protect yourself against Snow Immersion Suffocation is to stay on groomed runs and avoid areas with tree wells and deep snow. When skiing or snowboarding in ungroomed areas ALWAYS ski and ride with a partner and keep each other in sight at all times. If you lose sight of your partner, act immediately! Snow Immersion Suffocation can be fatal in minutes! By entering into ungroomed areas, you voluntarily accept the risk of Snow Immersion Suffocation. 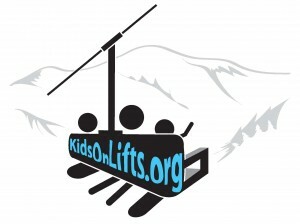 It is your responsibility to know how to ride a chair lift safely. Children under 51" tall are required to ride with an adult, and if in a lesson may not always ride with an instructor. Remove and carry backpacks. Do not use phones, music or games while loading or unloading. ABSOLUTELY NO horseplay on the lifts. Get On - As a chair passes you at the "Wait Here" sign,, move ahead quickly to the "Load Here" sign and line up evenly. When the next chair comes behind you, sit on the seat, and slide back as far as you can - to keep from falling off the chair. Sit Back, Sit Still, Hold On - Sit way back to keep from falling from the chair and enjoy the ride to the top! No horsing around, it's dangerous when you are riding up in the air. At the Top, Plan Ahead to Unload - At the "Unload Here" sign, it is time to get off. Stand up, and ski down the ramp. Watch for others ahead and ski around them. Move out of the way quickly, so others can unload too. 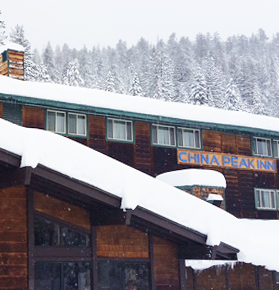 China Peak Mountain Resort maintains an open boundary policy. The terrain beyond the ski area boundary is in its natural state and entering the backcountry involves risks including those posed by deep snow, avalanches, steep terrain, cliffs and other terrain variations. The ski area assumes no responsibility for skiers or snowboarders beyond the ski area boundary. Areas beyond the ski area boundary are not patrolled or maintained. The cost of rescue in the backcountry, if available, will be the responsibility of you or your heirs. By entering the backcountry beyond the ski area boundary, YOU ASSUME ANY AND ALL RISKS OF INJURY OR DEATH. Helmets are recommend while skiing and snowboarding. Visit Lids On Kids.org for more information on helmet safety. Any person who is involved in a skiing or boarding accident and who leaves the scene of the accident knowing or having reason to believe that any other person involved in the accident is in need of medical or other assistance, except to notify the proper authorities or to obtain assistance, shall be guilty of a misdemeanor. California Penal Code 653(Q). The use of electronic devices with headphones while skiing, snowboarding and riding lifts or using surface transport is unsafe and discouraged by China Peak Mountain Resort. Snow cats, snowmobiles, other vehicles and snowmaking equipment and operations may be encountered at any time. China Peak's Beacon Basin gives you a chance to test your transceiver skills with 8 permanently buries customizable avalanche transceivers connected to a central control panel. Please contact Ski Patrol for more information. Donated courtesy of Back Country Access. CLICK HERE FOR MOUNTAIN BIKE SAFETY INFORMATION.